I don't blog about my personal passions outside of software development very often, but today's announcement of my absolutely favorite baseball player requires a moment. When Greg Maddux got signed by the Atlanta Braves in '92, he was immediately my hero for two reasons: he spurned a bigger offer by the Yankees to come play for the Bravos; and he was a thinking man's pitcher. 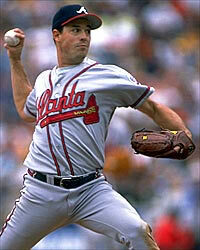 Maddux was never the hardest thrower, the most physically gifted or even had the nastiest stuff. What he had over every other pitcher of his day (and batter for that matter) is that he understood how baseball works. He threw first-pitch strikes, didn't walk people and would prefer to get a weak grounder to a strike. He was a master of his craft who not only wanted the ground out, but wanted the infielders to know which side of the diamond is was coming to. I remember being at the stadium when Maddux and Pedro Martinez dueled in a 1-0 game (that I think the Braves lost) in about 2 hours and 10 minutes. It was amazing to see. Even after he left the Braves, i'd watch him pitch for other teams (which is astounding if you know me...I won't even watch the playoffs if the Braves are out of it...I am a Braves Fan, not necessarily a baseball fan). His stats are impressive: 355 wins, 3.16 ERA, 109 complete games, 35 shutouts and over 5000 innings pitched. For all the stats, it was his defense that he seemed particularly proud of. It seemed to me that he thought that there were five infielders for a reason. That's why he earned a record 18 gold gloves for his position.